Circle Eights Las Cruces, N.M. Calling since 1972 Member New Mexico Callers Assoc. Ted Clement began taking square dance lessons at his wife's suggestion. At the end of the lessons he told the caller that he would like to call too. He was told that the best way to learn to do that was to find 4 couples that wanted to learn to square dance and teach them. Doing that he would learn how to call along the way, that was in 1973. He has been calling and teaching square dancing ever since all over southern New Mexico. Ted currently calls for 2 clubs in Las Cruces, 1 club in El Paso and 1 club in Alamogordo for a total of 7 dances a month. He also teaches lessons in all three cities beginning every fall. He has called at the National Square Dance Convention several times and for club across the US. Ted and his late wife, Lois, were elected to the NM Square Dance Hall of Fame in 2006. When Ted isn't calling square dancing he works at a USDA Research Ranch, doing everything that ranchers do. He rode in the Lincoln County Pony Express Race many times and holds the record for the most wins and fastest time. Ted also is a team roper, both heads and heels, and still has horses and steers to work. So he truly is a cowboy who calls square dancing. Now that he is semi-retired from the ranch he is available to call outside of the local area for one night stands and festivals. 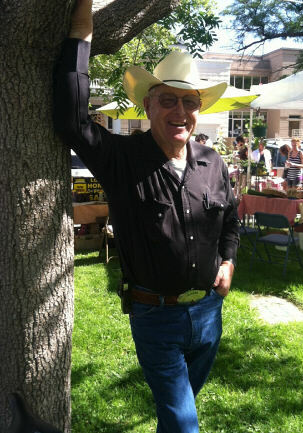 Ted loves to teach square dancing and has lessons beginning every September in all 3 cities. All are invited to come and try Modern Square Dancing. The first 2 lessons are free.